​"Elections have consequences" is a phrase often heard in the United States when there is a change in the leadership of the executive branch, or a shift of party majority in Congress. It is generally meant to connote that the agendas of the losing or minority party are now in danger of not being implemented. With the installation of the Trump administration, the consequences of the election and its attendant political agendas could well be drastic. For those of us with a care for the environment, both in our local communities and on a global scale, there is much legitimate cause for alarm, in the form of the environmental deregulation and climate change denial policies supported by this administration. Trump once famously claimed that the concept of global warming was "created by and for the Chinese in order to make U.S. manufacturing non-competitive." He has since attempted to distance himself from that statement, saying in a New York Times interview that he has an "open mind" about climate change but then "went on to repeat some of the same false and misleading claims that have been used by those who reject mainstream climate science." Certainly President Trump has never expressed any great concerns over the issue of climate change, nor the need for any immediate action to combat it. In fact, as noted by many media outlets, all references to climate change have now been deleted from the official White House website, replaced by the "America First Energy Plan," which calls for, among other things, the removal of "burdensome regulations" from our energy industry. That Trump has no great concern over the issue of climate change is evident in the numerous climate-change deniers among his Cabinet picks. Chief among these is Scott Pruitt, Trump's pick to head the EPA. He’s an outspoken climate change skeptic who, as Oklahoma’s Attorney General, disbanded the office’s Environmental Protection Unit and replaced it with a special “Federalism Unit” to challenge EPA pollution control measures. Last year, he also sued to block EPA rules to protect rivers, streams, and wetlands under the Clean Water Act, including streams relied on for drinking water by one in three Americans. And yet, in the aforementioned America First Energy Plan, it is stated that "protecting clean air and clean water, conserving our natural habitats, and preserving our natural reserves and resources will remain a high priority. President Trump will refocus the EPA on its essential mission of protecting our air and water." Protecting clean air and clean water while gutting already inadequate regulation of polluters is analagous to performing a double leg amputation on an athlete to help her run faster. Much of Trump's reasoning for deregulation is based on the tired old premise that regulations equal a loss of jobs. That premise has been disproved in a recent report by the Environmental Integrity Project, "Don't Believe the Job Killer Hype." The report examines data from the U.S. Bureau of Labor Statistics, as well as reports from the U.S. Office of Management and Budget, and more than two dozen economists and researchers. The federal government data show that only about two tenths of one percent of layoffs are caused by government regulations of any kind, including environmental regulations. Layoffs are caused far more often by corporate buyouts, technological advances, and lower overseas labor costs. “The evidence shows that there is simply no truth to the idea that regulations kill jobs or stifle growth,” said Eric Schaeffer, Executive Director of the Environmental Integrity Project. According to EIP, President Elect Trump’s website praises Pruitt for his opposition to what it calls “job killing” regulations. This term has been used repeatedly by Trump and Congressional Republicans, but an examination of economics data and literature reveals that the claim lacks a factual foundation, and is "just an empty rhetorical device that journalists should challenge and the public should reject." With regard to shale-gas drilling and fracking, the America First Energy Plan states that "the Trump Administration will embrace the shale oil and gas revolution to bring jobs and prosperity to millions of Americans." In September at the Shale Insight Conference in Pittsburgh, Trump told the shale-gas industry: "You are going to like Donald Trump" because he promised to weaken regulations on gas drilling and pipeline construction. How federal policy will affect state regulations of drilling and fracking remains to be seen. Paula Reed Ward/Post-Gazette. Protesters chanting "Donald Trump you can't hide, we can see your greedy side!" assemble in front of the Duquesne Club Downtown before the Donald Trump appearance there. Fracktivists and climate change activists had their hands full with the Obama administration and policies which, while woefully inadequate in their addressing of climate change issues and environmental concerns, were at least PRESENT. Now many of those policies are threatened with deep erosion if not total annihilation. Activists will now have a more difficult time than ever in trying to forestall climate collapse and to promote a renewable energy future in the United States. One can only hope that the dollar signs represented by the renewable energy sector, domestically and globally, will be sufficient to penetrate the thick shell of Trump's campaign rhetoric. In the meantime, Penn State climate scientist Michael E. Mann has called Trump's election the "worst possible scenario" for climate action. So yes, there is cause for alarm and concern regarding the Trump election. The potential "consequences" of this election are most ominous indeed. And yet all is not lost. The election has created a much-needed bright line for urgent and immediate action. Under a Trump regime, incremental change is no longer an option, if indeed it was ever an appropriate response even prior to Trump, given that we are facing a truly existential threat from climate change. As was posted Jan. 27 on the Alternative NOAA (see below) Twitter account: "As hard as this is for some people to hear, we have to put planet before country. We don't get to file bankruptcy when we destroy Earth." As evidenced by the hundreds of marches and millions of marchers who protested Trump policies on Inauguration Weekend, both in our country and around the world, there is an informed and energized citizenry present in our country and globally, protesting for climate science and the environment as well as the many other causes now under attack from the Trump presidency. In addition to the marches, personnel within the government itself are pushing back against Trump's anti-climate, anti-environment policies. "Unofficial" Twitter accounts from the National Park Service, NASA, NOAA, EPA and the U.S. Forest Service have sprung up "to fight for the right to share factual information" on climate change, defying Trump's gag order to these agencies regarding this subject. And in a case where a government agency (the Centers for Disease Control and Prevention [CDC]) did cave in to the Trump administration's climate skepticism and canceled a long-planned conference on the effects of climate change on public health, private citizen Al Gore stepped in and revived the conference, which will now be sponsored by non-governmental groups. As Dr. Mann stated in his interview with Stateimpact PA: "We’re not going to see progress from the executive branch. We’re not going to see it in Congress. We’ll have to look elsewhere. The good news is, if you start looking elsewhere, you see some reasons for cautious optimism. If you look to California... the whole West Coast. Washington and Oregon are part of an alliance, along with British Columbia. Then you’ve got the New England states that are part of an alliance. It turns out, about a third of the public live in states that are part of consortiums that are acting. We’re seeing progress at the state level." The power to push forward the cause of climate and environmental action, while officially dead at the federal level of government with the election of Trump, is definitely ALIVE AND WELL with the PEOPLE, with US, with YOU! Melissa Troutman & Josh Pribanic of the investigative news nonprofit Public Herald report on their 3 year investigation of Pennsylvania DEP records on thousands of cases of water contamination from fracking. Families in the Woodlands, Connoquenessing Twp., Butler County, are entering their sixth year without clean water and they blame gas drilling. In Beaver County, Potter Township supervisors have delayed a decision on a conditional use permit for the Shell ethane cracker plant and have asked the company for more information. ​By building its cracker plant and several other chemical units under a permit granted to a former zinc smelter that was on the same site, Shell would be free from regulations put in place in 2010 to limit the discharge of total dissolved solids into state waterways. PA investigative news organization PublicSource monitored the air quality at five homes in Penn Township, Westmoreland County, near the township’s first well pad in late 2015. This is what they found. Climate experts implore us to leave fossil fuels in the ground. Pennsylvania Governor Tom Wolf effectively ensured that our state will be part of the problem, not part of the solution, when he announced his new Pipeline Investment Program (PIPE). Roughly $2.5 billion of PA's Public School Employees’ Retirement System (PSERS) is invested in fossil fuel companies -- including 15 of the 20 firms most frequently cited for health and environmental violations in Pennsylvania. In December, a group of retired teachers presented PSERS board members with a letter signed by more than 200 teachers from across Pennsylvania, calling on the retirement fund to divest from fossil fuels. On Jan. 25, a bill (SB 175) was introduced in the PA Senate that would prohibit DEP from adopting methane emission regulations for the oil and gas industry or any source that are more stringent than federal standards. Pennsylvania counties and municipalities mishandled millions of dollars meant to offset the negative effects of the Marcellus Shale gas boom, according to a report published Dec. 6 by the state Auditor General. Weak oversight and unclear limits in Pennsylvania’s impact fee law have allowed some local governments to spend the money in ways that have little to do with addressing the natural gas drilling-related pressures the funds were meant to offset. Pittsburgh Post-Gazette featured a story about western Pennsylvanians who traveled some 1,300 miles to the Standing Rock Sioux Reservation, where Native Americans hoped to stave off construction of the Dakota Access Pipeline. Public Herald recently featured a write-up about Pittsburgh photojournalist and climate activist Tom Jefferson. On Feb. 3, a bill (H.R. 861) was introduced in Congress to terminate the Environmental Protection Agency. In December the U.S. Environmental Protection Agency (EPA) released its widely anticipated final report on hydraulic fracturing, or fracking, confirming that the controversial drilling process indeed impacts drinking water "under some circumstances." Notably, the report also removes the EPA's misleading line that fracking has not led to "widespread, systemic impacts on drinking water resources." On Dec. 9, the Federal Energy Regulatory Commission conclusively rejected the only U.S. West Coast plan to ship liquefied natural gas from Canada and the Rockies to Asia. FERC commissioners announced that they had again voted unanimously to refuse federal approval for the $7.6 billion Jordan Cove Energy Project export terminal and the Pacific Connector Gas Pipeline (PCGP). In Wisconsin, there is controversy over a company wanting to turn wetlands into frac sand mines. The law permits it as long as the wetlands are replaced, but doing so is nearly impossible. National Geographic published this in-depth look at the water protectors of Standing Rock. The ongoing protest of the Dakota Access Pipeline (DAPL) by the Standing Rock Sioux tribe and their allies is being covered and documented expertly by Democracy Now! Click here to read the latest from DN! on this important resistance action. A group of U.S. military veterans has vowed to block completion of the hotly disputed Dakota Access pipeline, despite the secretary of the Army giving the project the green light. "That pipeline will not get completed. Not on our watch," said Anthony Diggs, a spokesman for Veterans Stand. 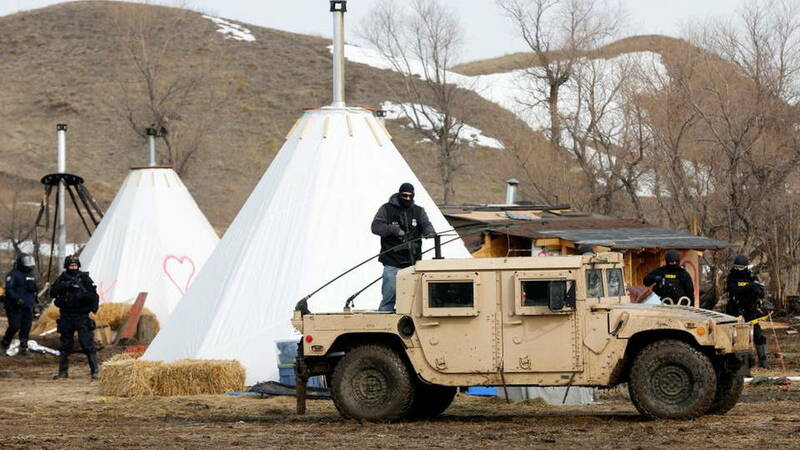 The main resistance camp set up by Lakota water protectors fighting the Dakota Access pipeline has now been largely vacated after protesters were ordered to leave the camp on Feb. 22. 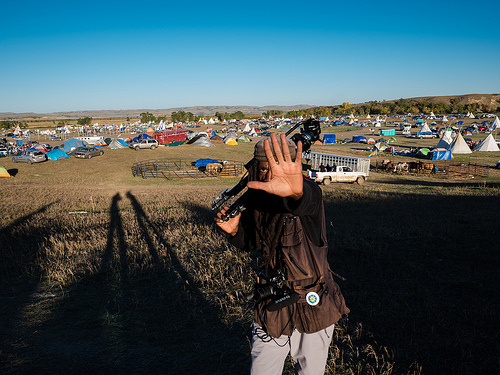 In an interview with Amy Goodman of Democracy Now!, Standing Rock Sioux medicine woman Linda Black Elk said: "This eviction from the large camp...is just a part of the process. I’m not deterred at all. We know we have to keep standing. The Dakota Access pipeline, and the fossil fuels industry in general, has to be fought on all fronts... We started a movement. We will continue to see that movement through for the sake of our children." Opponents of unconventional natural gas extraction have introduced a bill in the Maryland Senate to ban the practice. Sen. Bobby Zirkin, the Baltimore County Democrat who is sponsoring the ban, said a series of regulations adopted to control fracking are not enough to protect public health and the environment. A bipartisan group of Florida lawmakers has called for a statewide ban on fracking. A U.S. energy regulator who filed his letter of resignation in late January may have temporarily brought any new rulings on multibillion-dollar natural gas pipelines to a halt. On Feb. 16 a group of about 20 Greenpeace activists dug room for and planted 15 meters of super heavy pipe sections at the ING headquarters in Amsterdam. They did so to protest against the Dutch bank's part in financing the highly controversial Standing Rock pipeline in North Dakota. After a parliamentary vote in January, Ireland could become the first country in the world to fully divest its sovereign wealth fund from fossil fuels. Lawmakers split 90 to 53 in favour of ditching coal, oil and gas holdings from the €8 billion (US$9bn) Ireland Strategic Investment Fund. The bill is expected to pass into law in the next few months after consideration by the finance committee. The fourth edition of the Compendium of Scientific, Medical, and Media Findings Demonstrating Risks and Harms of Fracking was published Nov. 17, 2016 by the Concerned Health Professionals of New York and Physicians for Social Responsibility. A story of how one PA resident experiencing health issues from nearby fracking got the EPA to pay attention to her air quality. A study by the Colorado School of Public Health at CU Anschutz shows a link between young Coloradans diagnosed with acute lymphocytic leukemia and their proximity to high-density gas development. On the heels of the shale gas rush that’s swept the U.S. for the past decade, another wave of fossil fuel-based projects is coming – a plastic and petrochemical manufacturing rush that environmentalists warn could make smog worse in communities already breathing air pollution from fracking, sicken workers, and expand the plastic trash gyres in the world’s oceans. Physicians for Social Responsibility has published a report which summarizes the negative implications of fracking for health. In September, the Pennsylvania Supreme Court ruled in the landmark Robinson Township case that the state legislature could not grant eminent domain authority to companies building gas storage facilities. On December 19, the lawyer helping Ellen and Elise Gerhart of Huntingdon County fight the Mariner East 2 pipeline was granted a motion to file new legal briefs based on the September Supreme Court decision, applying the gas storage facility/eminent domain argument to pipelines. Opponents of the controversial Mariner East 2 pipeline project are accusing two townships along the route of failing to enforce ordinances that would be violated by the pipeline in those locations. The complaints argue that ordinances allowing industrial development in non-industrial zoning districts violate residents’ due-process rights. And they say that for any zoning to meet state and federal constitutional requirements, it must promote public health, safety, and welfare. On December 28, a federal court directed the U.S. Environmental Protection Agency to review and possibly update its regulations on oil and gas waste, in a decision that was welcomed by environmental groups who had sued the agency, claiming its rules have failed to keep pace with the fracking boom. According to the SRSrocco Report, the countdown to the demise of the great U.S. shale gas industry has begun. As massive new pipeline projects continue to generate news, the existing midstream infrastructure that’s hidden beneath our feet continues to be problematic on a daily basis. Since 2010, there have been 4,215 pipeline incidents resulting in 100 reported fatalities, 470 injuries, and property damage exceeding $3.4 billion. As pipelines age and accidents happen, the United States has seen a spike of energy infrastructure incidents in the 21st century. The website pipelineaccidentshappen.com reveals graphically the annual number and scope of pipeline accidents in the U.S. since the year 2000. "These incidents demonstrate the impact this has on the land, wildlife and people that can take years to recover from." As of Dec. 18, 2016, three years and three months later, a massive oil spill in North Dakota still hadn't been fully cleaned up. The company responsible hadn't even set a date for completion of the clean-up. 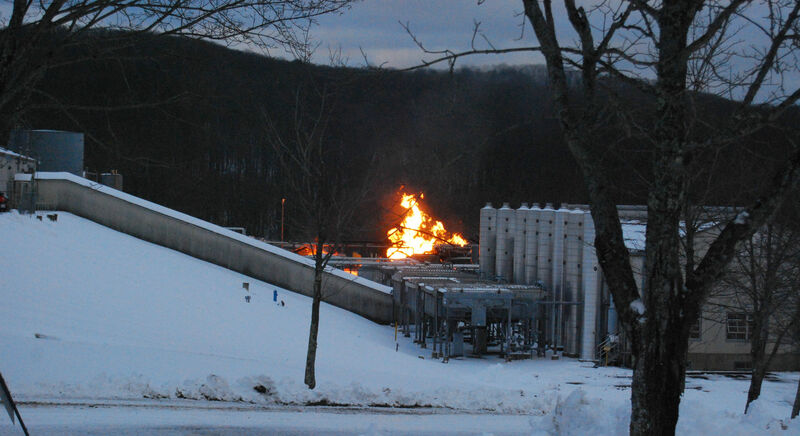 On New Year's Day a massive fire occurred at a Washington County gas well pad. ​In December, a six-inch crude oil pipeline operated by Belle Fourche Pipeline Company in western North Dakota was shut down following discovery of a leak. The amount of the spill, called "significant" by a state investigator, was not immediately known, but oil had leaked into the Ash Coulee Creek in Billings County. The site of the spill is about 200 miles from the camp where members of the Standing Rock Sioux Tribe and their supporters have been protesting the construction of the Dakota Access Pipeline. A series of small earthquakes in Lawrence County last year have been linked to hydraulic fracturing operations at nearby Utica Shale wells, according to an investigation by PA DEP. PA state permits for fracking waste disposal injection wells will require the operators to perform seismic monitoring around the wells and to make the data picked up by the sensors publicly available. ​The “climate kids” case Juliana v. United States is shaping up to be not only a historic trial of the culpability of the U.S. government for destruction of the earth’s climate, but of the power of courts to protect our rights. A study from 1979 proved remarkably accurate in showing how global warming would affect the Arctic's sea ice, currently in steep decline. ​In December, the Weather Channel issued this note to Breitbart: Earth Is Not Cooling, Climate Change Is Real and Please Stop Using Our Video to Mislead Americans. How should climate scientists react to a president who calls global warming a “hoax?” How much should they prepare for his administration? And should they ready themselves for the worst? ​Methane may not last long in the atmosphere — but it drives sea level rise for centuries. Pueblo is the 3rd city in Colorado and 22nd city in the United States, and Moab is the 3rd city in Utah and 23rd city in the United States to formally commit to 100% clean, renewable energy. Forbes.com published this report in November and recently reposted it on Facebook, showing how clean energy can withstand changing political winds, including the anti-environment Trump administration. Arnold Schwarzenegger's amazingly well-reasoned Facebook post about climate change and clean energy. In Nov. 2016, Burlington VT had the distinction of becoming the first city in the U.S. to draw 100 percent of its power from renewable sources. The city of Las Vegas officially achieved a milestone in December when Boulder Solar 1 — a solar power plant on the edge of Boulder City, Nevada — went live. The plant's acres of solar panels will provide 100% of the city's municipal power, excluding commercial and residential buildings. In December Google announced that it had reached 2.6 GW of renewable energy purchased, putting the company on pace to reach 100 percent renewable energy in 2017. An ambitious group of engineers is pitching a plan to circulate some of the millions of gallons of groundwater that have flooded mine shafts in NY's Adirondack Mountains over the years to power an array of 100 hydroelectric turbines a half-mile underground. Nearly 5.7 million kWh of wind power was generated in Sweden as the country harvested the effects of intense storms in southern Sweden over Christmas 2016. 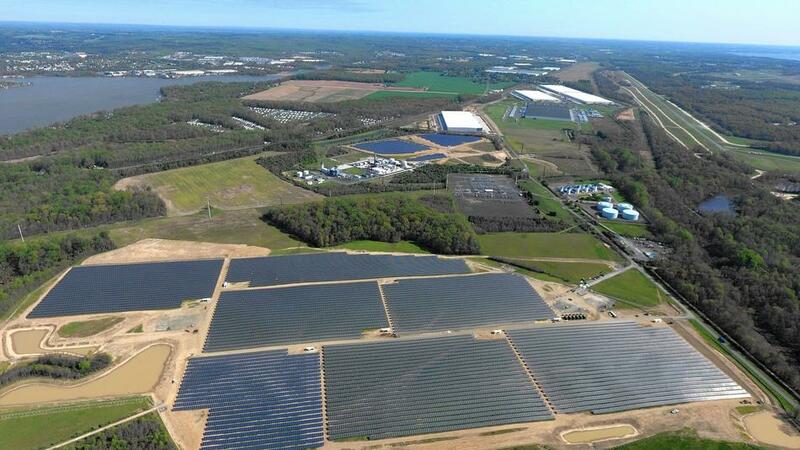 ​Tens of thousands of solar panels occupy a field on the Perryman peninsula in Harford County, MD, soaking up energy from the sun, turning it into electricity and storing it for government and nonprofit customers in the region who want to use it. Tesla CEO Elon Musk has said he wants his company to be building 500,000 electric cars a year by 2018. That's an ambitious goal, but at least one necessary piece of the puzzle is already in place. Tesla's factory in Fremont, California, previously produced that many cars when it was a joint operation of General Motors and Toyota. Pope Francis, long known for his commitment to environmental stewardship, now owns an electric car, a Nissan LEAF. St. Patrick’s Cathedral recently inaugurated the final phase of its restoration with the full activation of a state-of-the-art geothermal plant. The innovative engineering plan for the plant was carried out by the Cathedral’s design team, who developed and repurposed the existing infrastructure to harness clean, renewable power from an underground system of wells. Tesla Motors and Panasonic completed work on an agreement to begin manufacturing solar cells and modules at Tesla’s factory in Buffalo, New York, eventually bringing some 1,400 jobs to the region. This talk will focus on how to discuss climate change and other environmental issues in persuasive ways to influence peoples beliefs, attitudes, and actions. We will cover the importance of knowing your audience, how to frame environmental issues, and potent communication tools such as stories. Part talk, part workshop; come to discuss, learn and practice these environmental communication techniques. Dr. Shawn K. Davis is an assistant professor in the Parks and Recreation Department at Slippery Rock University. He completed a masters degree in human dimensions of natural resources through a fellowship program with Walking Mountains Science Center in Colorado. Shawn’s Ph.D. research at Colorado State University involved investigating place-based educational strategies for communicating climate change in America’s National Parks and National Wildlife Refuges. His current research involves a collaborative project that partners rock climbers with bat biologists to discover roosting locations in Colorado. Outside of the classroom, Shawn enjoys sailing, rock climbing, backpacking, trail running, hunting, skiing, biking, and living sustainably with his family. Home Improvement Businesses, Green Products & Services, ​Kid's Activities and Crafts, Grass Roots Groups. ​Throughout the first 100 days of Donald Trump's presidency, the People's Climate Movement has been and is organizing a country-wide arc of action, culminating on April 29th with the People's Climate March in Washington DC and "sister marches" around the country in a powerful mobilization to unite all of our movements. One of those sister marches on Apr. 29 will be right here in Butler PA. Starting at 11 a.m., the march will proceed through downtown Butler to a rally at Diamond Park. For details please see the events FB page.